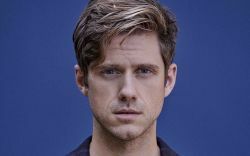 Star of Catch Me If You Can and Next to Normal, Aaron Tveit comes to SF from the Pre-Broadway tryout of Moulin Rouge. Aaron’s TV credits include Danny Zuko in “Grease Live.” He also played Enjolras in the film adaption of Les Miserables. He will be performing songs from his solo CD "The Radio In My Head". Presented by Feinstein's.